Does the thought of public speaking terrify you? Do you have a sales position and want to improve your skills? 5 years ago I started a new job which included frequent public speaking. I had never taken a public speaking or communication course and was very nervous. VirtualSpeech would have been a great service to have back then. With VirtualSpeech I could have practiced speaking in front of a virtual audience and immediately gotten feedback about how I did. In this article I’ll review VirtualSpeech so you can determine whether it can help you. Online education has become a great way to learn about skills, including public speaking; but the public speaking courses usually lack the ability to really develop the speaking skills you are learning through practice as you would get in a real-world class. VR speech learning apps solve that problem by providing simulations where you can practice the speaking skills you are learning. Some can also provide feedback by monitoring things like speech patterns, eye contact, and movement as you will see in the information below. If you want to learn public speaking and you have the opportunity to take a course in person, that may be a better option. However, for people who don’t have the ability to attend a course in person or want to quickly develop new skills for their job, virtual public speaking apps may be just what you need. There are several public speaking apps available which offer virtual reality scenarios for practicing the skills you are learning. Whether you are considering VirtualSpeech or another learning app, there are a few things you should consider, first. What kind of VR equipment and/or smartphone do you have? The various speech training apps were developed for different platforms. Before you decide on an app, check to see if it’s compatible with the equipment you have or, if not, what the additional cost will be to get that equipment. ​Do you need instruction or just practice? Most of the speech training VR products only provide the VR environments to practice speaking. There may be evaluation and feedback features in the practice software, but that’s different from receiving instruction from a person as to how to speak publicly in the first place. VirtualSpeech is the only product, currently, which offers online courses on public speaking. ​​Is customization important to you? Pricing can range from free to a few hundred dollars and one, Ovation, has a monthly subscription for their VR speech app. ​​​What is your budget and how long do you need the product? Pricing can range from free to a few hundred dollars and one, Ovation, has a monthly subscription. VirtualSpeech is a speech learning app which offers both online courses for various types of speaking and realistic virtual simulations in which to practice those speaking skills. They offer a wide variety of courses and training simulations to choose from including public speaking (speeches), job interviews, business networking, boardroom presentations, press conferences, and more. VirtualSpeech offers evaluation and reporting which help you hone your skills. The product can track eye contact, voice attributes, your speed of delivery, and use of filler words. You can also record your training sessions for further review. VirtualSpeech is the market leader for VR speaking training with no one offering the combination of features and services which VirtualSpeech offers. Every other speaking training app focuses solely on public speaking and none offer online courses for instruction. This product is for people who want to learn about and train in speaking, both public and private. VirtualSpeech is also for those who fear public speaking (or any other kind of speaking) and want to get over that fear. If however, you have a very limited budget or you want additional tracking for hand movements, you may want to check out some of the alternatives. VIrtualSpeech is available for Samsung Gear VR, Oculus Go, and Daydream View. Cost: $75-$280, depending on the course and whether you need VR goggles. There are 13 courses available at the writing of this review, including Essential Public Speaking, Job Interview Preparation, Business Networking, Sales Pitch and Closing, and more. These courses offer hours of instructional education about the type of speaking you want to learn about and develop. These courses include up to 70 lessons and up to 6 VR scenarios. This is a feature unique to VirtualSpeech compared to other speech learning apps. VirtualSpeech offers a wide variety of environments in which to practice and hone your skills. These environments include different size speech venues, boardrooms, interview offices, and more. In addition, there is a level of avatar interaction which creates a more realistic setting. With surround sound, the simulations include distracting sounds like coughing, phones ringing, and speaking. 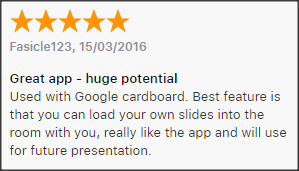 You can also upload slides for a presentation so you can give your presentation is as realistic a scenario you as possible. As you practice the speaking skill that you are learning in the virtual simulation, the software tracks things like eye contact, the speed you speak, the use of filler words, and voice volume. After you finish the scenario, VirtualSpeech will show you scores for those tracked behaviors and compare those scores to what experts have determined are the best behaviors. You can then use this feedback to improve your speaking skills by working on the behaviors for which your score wasn’t optimal. Even with the computerized evaluation and feedback you receive with VirtualSpeech, it is still helpful to get more detailed feedback from real people. They can comment on things that aren’t tracked by the system and give further advice for correcting mistakes. To help with this, your sessions in the simulation can be recorded and then uploaded to your learning portal. You can then send those sessions for further evaluation to a trainer if you have one, or to your instructor, if you are taking the course. 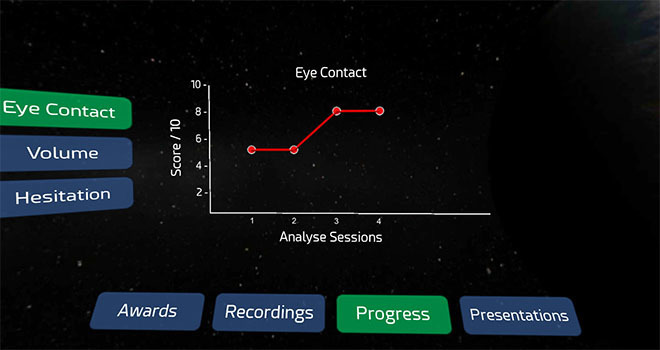 As mentioned above, VirtualSpeech evaluates various speaking behaviors and scores your results. Those scores are saved. Then each time you try a simulation again, you can compare your score to your previous scores to track your improvement over time. If you are part of a company that would like to either use the existing VR scenarios or create custom scenarios, VirtualSpeech is willing to do that. You can add your branding to VR scenarios in addition to creating custom scenarios and custom venues. So, if you want your employees to be able to practice presentations in a VR scenario that looks just like your conference room, you can do that. 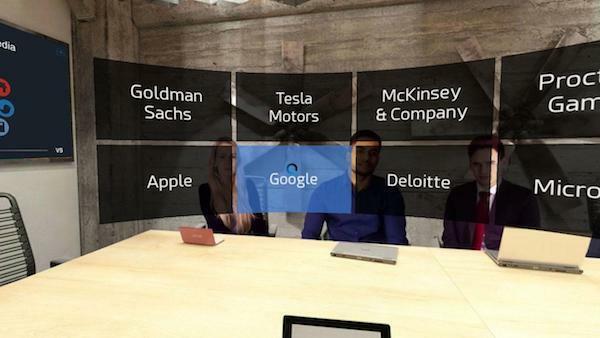 This allows companies to use VirtualSpeech’s VR technology to train their staff. What are people saying about VirtualSpeech? I scoured the internet and found some user reviews that seemed rather positive. Ovation was recently released in October 2018. It has all the VR simulation capabilities VirtualSpeech has, but also has some additional, helpful evaluation and training features. Ovation can track hand movement and microphone position (simulating hand-held microphone usage). These features aren’t available in VirtualSpeech. Also, Ovation offers live feedback for eye contact, filler words, and microphone placement in addition to reports shown after your speech. VirtualSpeech only has reporting after the fact. Ovation doesn’t, however, offer online training courses like VirtualSpeech does nor do they have other speaking practicing options, like private conversations and emergency press conferences. One additional note is that Ovation appears to be primarily targeted at enterprise usage. While this is helpful if you need an enterprise solution, for regular users it means that some of the setup controls are not very intuitive. Available for Oculus Rift or HTC Vive. Ovation has a monthly subscription price of $19.99 for individuals and $49.99/user for organizations. If you don’t need instruction via online courses and are only looking for practicing/training for speech giving, Ovation may be a great option for you. With its additional feedback features, it gives VirtualSpeech a run for its money. Virtual Orator is very similar to VirtualSpeech, though without the option of online training courses. One interesting feature Virtual Orator has which is not available in VirtualSpeech are programmable audience responses/questions. Responses or questions can be pre-programmed into the scenario and a virtual member of the audience will give the response or question during your presentation. As with all the alternatives I mention here, Virtual Orator is limited speech giving training and does not offer online courses for instruction. Available for Oculus Rift, HTC Vive, and Windows Mixed Reality. Virtual Orator is available for $300 for single users and $3000 for the enterprise edition. If you want to be able to program audience responses, this may be worth looking into. However, keep in mind that Virtual Orator is also the most expensive option. Presentation Simulation is the simplest of the alternatives. It only offers the public speaking simulation. There is no feedback, live or after the speech and no courses for instruction. There are a few venues/sizes to choose from. This is just a practice simulation for public speaking. However, it has one very nice feature. It’s free (or you can give a $9.99 donation). If you just want to get over your nerves before a speech or presentation and don’t want to spend much (or any) money, this may be a good option for you. Public speaking and even private conversational speaking can be difficult and just plain scary. You may not even know where to start or you may know how to speak, but need to work to hone your skills. VirtualSpeech can help you get over your fears and work at improving your skills. By placing you in a realistic simulation, you prepare yourself for the challenges of speaking. With feedback and history tracking, you can continue to work to improve your ability to speak. The inclusion of online courses for instruction sets VirtualSpeech apart from its competitors. The other feature that sets VirtualSpeech apart is the wide variety of speaking situations you can learn about and practice in. All the alternatives only offer speech giving, but VirtualSpeech also offers courses and simulations for job interviews, business networking, sales pitch closing, and more. If you need to work on your speaking skills or get over a fear of public speaking and especially if you need instructional training for how to speak, I encourage you to go to https://virtualspeech.com/ and learn more about what they have to offer.